I've always wanted to learn how to write native apps for iOS and the Mac as long as either has existed. However, the barrier of entry has always been too high, given that I only ever had time to play with them as a hobby. The Objective-C programming language is a bit complicated to learn, especially alongside all the memory management that you have to do (and it doesn't help that Apple has gone through several memory management schemes through Mac OS X versions). To add on to that, the Cocoa framework is huge, and it's quite daunting to even know where to get started with it. With Apple's announcement of the Swift programming language in June, it was clear to me that the language would significantly lower the barrier of entry. The XCode 6 beta is now public (i.e., you do not need to have a paid Apple Developer account to access it), so anyone can play with Swift. Note that I am still very new to both Swift and iOS development in general, so it's quite likely that some of the things I mention here are actually bad ideas. If you know more than I do and spot a bad thing that I am doing, please mention it in the comments. It's also possible that some of the assumptions I've made about the Swift language or the SpriteKit framework are actually wrong. Please remember that I am still a beginner and take what I say with a grain of salt. If you don't know how to program at all, I don't know how well this will work for you. I already know several language, especially Python, so my experience derives from that. First, read through the Swift language guide. If you have XCode 6, you can read it interactively as a Playground. I only have read through the first part so far, which gives a high-level overview of the language. var and let seem a bit confusing. The difference is actually quite simple: var denotes a variable that can change and let denotes a variable that cannot. You could in theory just use var for everything, but let lets the compiler spot mistakes for you, and it also probably lets it make your code faster. If you intend to never change the value of a variable, use let. Swift uses type inference, meaning that you usually don't need to specify types. But when you do, you do so by putting a : after the variable name, like var a: Int = 2 or func f(a: Int). The exception is the return type of a function, which uses the arrow -> (if you are familiar with Python 3 type annotations, the syntax is exactly the same), func f(a: Int) -> Int. Swift uses ? after a type name to indicate that a variable could be its given type, or nil. If you are familiar with Haskell, this is like the Maybe monad. I know very little Haskell, so I don't know if Swift's implementation of ? is truly a Monad. Roughly speaking, in many circumstances, you don't know if a variable will actually be the given type or not. A good example of this is with dictionaries. var a: [String: Int] creates a dictionary that maps strings to integers. If you manipulate this dictionary, and then access a key from it, like a[b], there is no way for the compiler to know if that key will really be in the dictionary. If the key is in the dictionary, you will get the value of that key. Otherwise, you will get nil. Hence, the type of a[b] is Int?. Swift uses ! to indicate that the value is not nil, which tells the compiler to compile code that doesn't check for that case. For the most part, you can ignore this as well, at least when you start. Just write code as you would, let XCode add in the types for you, and only worry about types if the compiler tells you something is wrong. Swift functions often require the parameters be named, for instance, you have to write CGSize(width: 1, height: 2) instead of just CGSize(1, 2). This is both for clarity (the former is much easier to read if you aren't familiar with the API for CGSize), and because Swift allows polymorphism, i.e., you can define different initializers for the same class with different type signatures. For example, CGRect can be initialized as CGRect(origin: CGPoint, size: CGSize) or CGRect(x: Int, y: Int, width: Int, height: Int). This can lead to ambiguities in some cases unless you explicitly tell the compiler which version to use. I've found Swift to be a very strict language. I don't mean this in the sense described by this Wikipedia article. What I mean is that Swift typically only lets you do things one way. This is similar to Python's "one way to do it," except Swift enforces this at the language level. A nice example of this is that I rarely get a warning from the Swift compiler. Just about every message I've gotten from the compiler has been an error. The difference is that the program will still compile and run with a warning. This is different from C, C++, and Objective-C, which have many warnings that the compiler will still compile with. These warnings usually are for things like an incorrect pointer type. Since there is really only one type in C, the integer (because all data in memory is just integers), the program can still run even if you mix your types up a bit. There are also many cases where Swift seems maybe too strict about things, although it's clear that it is doing it to try to stray people away from common mistakes and antipatterns. For example, the condition of an if statement in Swift must always be of type Bool. Unlike languages like Python, things do not have implicit boolean values. if 1 is a syntax error. So is if a unless a is type Bool. This ends up not being a big problem. The things Swift forces you to do feel like good programming practices. This is not unlike how Python "forces" you to keep your code indented correctly. It feels very different from a language like Java, where the things that you are forced to do all feel like they are there simply to make the compiler writer's life easier. And indeed, unlike Java and Objective-C and much like Python, Swift code requires very little boilerplate. There are no header files for instance. So all said and done, I like Swift. I don't like it as much as Python (I also don't have my head wrapped around it as much as Python). But it's far better than Objective-C, and that's what matters. Frankly, my biggest gripe with it is the ubiquitous use of CamelCasing and two letter prefixing (NS, CG, SK; I don't know if there's a name for this) in the API. I adamantly refuse to do this with my own variables, because I believe CamelCase reduces readability over underscore_casing. I like the Python convention to use underscore_casing for variables, functions, and methods, and CamelCase for classes (because classes are kind of like proper nouns, and CamelCase is as close to Capitalization as possible in programming language conventions). While it is not necessary to write Objective-C any more, it is a good idea to know how to read it. The reason is that a lot of good resources on the internet are still in Objective-C (also a lot of Apple's example documentation). The API names are the same, so this mainly boils down to understanding how to convert the basic syntax to Swift. Reading the section of the Wikipedia article on the syntax of Objective-C should be enough. If you are comfortable with the Swift language itself, you should get started with a project. First off, you should use XCode to edit your code, at least to begin with, even if you are accustomed to using another editor. The reason is that XCode is going to do a lot of things for you which will make your life easier and reduce the complexity significantly as you get started. Once you are comfortable, you can move to another editor. Autocompletion: The best way to figure out the Cocoa APIs is to use the autocompletion. This pops up when you want to override a method in a subclass, create an object from an existing class, access an attribute of a class, or instantiate a class or call a function (remember that Swift is polymorphic, so it's useful to know all the possible ways to instantiate a class or call a function). Compiler errors and warnings: Swift, being a strictly typed language, will give you a lot of useful compiler errors. It's pretty hard to write a program incorrectly from a type point of view, and have it even compile. XCode integrates this nicely, and it even offers suggestions on how to fix things every once in a while (so that you can just click the button and have it fixed inline). Direct interaction with the iOS Simulator: One button will compile your code and start the simulator. If your target is Mac OS X, it will open the application. Debugger: Clicking to the left of a line will set a breakpoint in the debugger. The Swift debugger seems pretty limited right now. I wasn't able to get any useful information out of the variables view when I used it. But in my experience using XCode in the past to debug C, its graphical debugger is one of the best. Configuration settings: If you click on the XCode project in the files view (the root node of all the files), you get a view with all the different settings for your project. Most of these you probably won't want to change, but a few are important, like what devices and orientations you want to allow, what operating system versions you want to support, and the name and version of your project. Editing these outside of XCode requires editing an XML file, which is no fun. One disappointing thing that I learned is that you cannot run any iOS program you write on an iOS device unless you are in the paid developer program (or if you Jailbreak and are willing to go through some hoops). The iOS developer program costs $100 a year, and since I'm not sure yet how far I am going to go with this, I am holding off on it. The only other option then is to run on the simulator. The simulator is fine, the only issue is that there are limits to how you can simulate a touch screen on a computer with a mouse. There are several things you can do with the "hardware" from the hardware menu, such as rotating the device or pressing the home button. It's worth remembering the keyboard shortcut for pressing the home button, ⇧⌘H, as you can press it twice in quick succession just like on a real device to open the task manger. You can then drag your app up to completely reset it, without having to restart the simulator. The retina iPad is taller than your display, even if you have a 15" retina display. So be aware that you will need to scroll up and down to see it all. Alternately, you can use a smaller device, like an iPhone, or rotate it to landscape, where it all fits. The only way to do multitouch is to hold down the Option key. This will create two fingers. However, it's quite limited as the two fingers are always centered around the center of the screen. Therefore if you want to test multitouching two objects, you'll have to position them symmetrically so that you can grab them both. The best way to start is to start a template project with XCode. I personally started with a SpriteKit game for iOS. This created a basic template "Hello World" Swift file with the basic SKScene subclass. Go ahead and compile and run this in the simulator to see what it does. There are four important methods of SKScene which you will want to override, didMoveToView, touchesBegan, touchesEnded, and update. didMoveToView is the initializer for the scene. Anything that should be set up and appear from the very beginning should go there. touchesBegan and touchesEnded are called when a finger touches the screen and when it leaves the screen, respectively. Remember always that iOS devices are multitouch devices, so these events can happen concurrently, and there can be multiple touches happening at once. The first argument to these methods is a set of touches, which you should iterate over to perform actions (the "Hello World" example shows how to do this). Finally, the update method is called every time the scene is updated, at each "frame" essentially. There are other methods, for instance, touchesMoved. However, I discovered that you don't actually want to use touchesMoved to do what you would think you'd use it for, namely, to move stuff around. The reason is that there is no easy way to sync up multitouches between touchesBegan (where you know what thing the finger started on) and touchesMoved to move it around. It works well for a single touch, but if you want to be able to move multiple things around at once (which I highly recommend, as it leads to a much nicer user experience), you have to do things a little differently, as I'll explain below. There are a lot of classes to create various objects of various shapes. I started with SKSpriteNode, which creates a simple square, because I wanted to play around with touch events. These lines go at the class level. This lets them be accessed from within any method of the class. it tells you that Test.Type does not have a member named 'a' on the let b = a + 1 line. You may have to use properties with getters and setters in this case, which I didn't feel like fooling with. The result is that I did not abstract out the CGSize(width: 30, height: 30) into a common variable. The self.addChild is the most important method here, as it actually puts the sprite in the main view. If you forget this line, none of the sprites will show up. 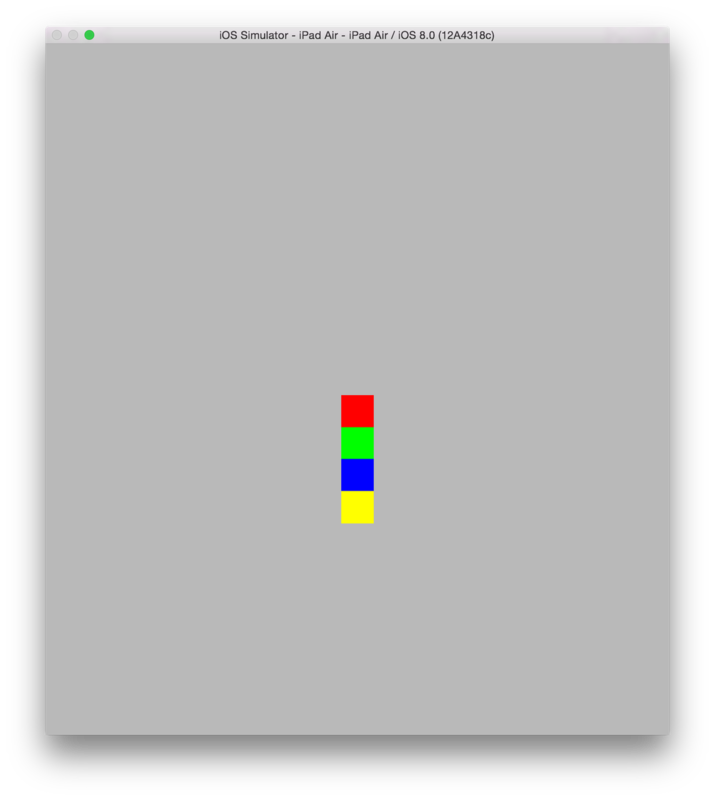 If you run this, you will only see the yellow box, because you put them all on top of one another in the center of the view. We could change the positions so that they do not overlap, but the option I went with was to play around with the physics a little. SpriteKit has a nice 2D physics engine built in, and it's quite easy to use. For each sprite, I create an SKPhysicsBody with the exact same size as the SKSpriteNodes (there's probably a more direct way to do this), and attach it to that node. The affectedByGravity property is important. If you don't set it to false, all the objects will fall off the bottom of the screen. I disabled allowsRotation because I wanted my squares to stay upright. Otherwise when when the squares hit one another they will rotate in space. Now SceneKit will prevent the squares from overlapping with one another, even if we put them on top of each other as we have done. Now, let's make it so that we can move these squares around. The correct way to do this took me some time to figure out. I finally got some hints from this site. The key thing here is that the UITouch objects remain the same objects for the duration of the touch. Their position is updated when the touch moves. Hence, you just need to associate each touch with the node that was touched when the touch began, and move the node to the position of that touch with each update. Then, in the touchesBegan method, map every touch to the node that it touches. The as UITouch part is needed because the compiler only knows that touch is AnyObject. This was one of the things that was helpfully suggested by the compiler, so I did not really need to know what I was doing to get it right. Note that even if you touch the background behind the squares, you are still touching a node, namely, the GameScene node itself (the node for the class you are working on). This is a very important observation, as it will tell us how to get the right position for the node when we update it. It also means that we should keep track of which nodes we actually want to be moved by the touch. Trying to move the GameScene node is ignored, at leads to a lot of console logs, so we should avoid it. Next, let's write the touchesEnded method. This method is simple. If a touch ends (the finger is removed from the screen), we should remove it from the selected dictionary. To delete an item from a dictionary in Swift, just set it to nil. Now, finally, we need to write the update method to move the node to the current position of the touch. Note that we only modify the position for the four sprite nodes. The touch.locationInNode(self) part took me a long time to figure out. There are other methods, like touch.locationInView(nil), but this does something very strange where the the horizontal axis was doubled (moving the touch one inch moved the object two inches), and the vertical axis was inverted. If someone knows what was going on there, please let me know. Modifying the position directly is nice, but it's nice to play around a little bit with a third thing from SpriteKit, actions. What we will do instead of setting the position of the node is to tell SpriteKit to move the node there in a certain amount of time. If we make this time small enough, like 0.01 seconds, it will appear to act exactly the same. If we up this time, there will be a smooth "lag" where the node catches up to the touch. Because the movement always happens in the same amount of time, it will move faster if the finger is farther away. This gives the squares a nice "frictioney" effect with some springiness to it, which is quite nice. There are many other actions we can perform, like rotations and color changes. Here is an example of the movement. You can see it works even with multitouch. You can also see the collision physics cause the other squares to move out of the way when another square hits them. Here you can see the movement lag caused by using SKAction.moveTo with duration: 0.1 (note that the mouse itself jumps a bit at the beginning, but this is due to lag in the recording). I have uploaded the full code to GitHub. This isn't exactly a "game", but it does lay down the foundations for what you would need to write a game in Swift using SpriteKit. At least for me, it shows me the technical basics of how to write some games that I had thought about, which mostly involve making shapes and moving them around the screen.